Chicago Public Schools is broke on purpose. For decades, politicians have diverted taxpayer money intended for Chicago’s public schools to fund their pet projects. Now that the system is “broke,” Chicago mayor Rahm Emanuel, Illinois governor Bruce Rauner and CPS interim CEO Jesse Ruiz think that teachers—and the parents of CPS learners—should expect and accept less. The Board has rejected the bulk of CTU proposals—including those with no additional costs to the district—and countered with rescinding a 7 percent pension pickup and renegotiating health care premiums and co-pays with demands that would likely consume 3 percent of teacher and education support personnel salaries. We have a governor who has his own ideas about cutting funding. Who are the set of people who can solve this problem? Those people who need to pay their fair share. Former mayoral candidate Cook County Commissioner Jesus “Chuy” Garcia drew the connection between a strong public school system and the ongoing violence in Chicago’s neighborhoods. We need to have a system of viable public schools and will not have safe neighborhoods until we do. It’s more critical now than ever before. He continued by emphasizing the unfairness of both how city services are managed and the small number of people making these important decisions for Chicago’s communities. How we treat the most vulnerable citizens of our city and of the state is important. All voices must be at the table to make these decisions and everyone paying their fair share will be needed. As the march stepped off to chants of “Whose streets? Our streets! Whose schools? Our schools!” – the size of the crowd swelled to the estimated four thousand as buses of marchers arrived from throughout the city. 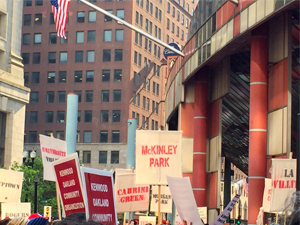 Marchers carried signs representing multiple neighborhoods including South Shore, Pilsen, Woodlawn, Cabrini Green, West Garfield Park, Back of the Yards, Chicago Lawn, Brighton Park, University Village, Bridgeport, McKinley Park, Morgan Park, Uptown, Hyde Park, Roseland, Belmont Cragin, La Villita, Kenwood Oakland, Albany Park, Rogers Park, and many more. There were also many community activist groups in the march including Action Now, Kenwood Oakland Community Organization, Albany Park Neighborhood Council, Brighton Park Neighborhood Council, The Grassroots Collaborative, Parents 4 Teachers, and Pilsen Alliance. These people are public money gamblers, siphoning money from our schools. They have an addition problem. They are addicted to gambling with our money…they have an addiction to privatization…It’s made them close our mental health clinics and 50 public schools…we need an intervention! 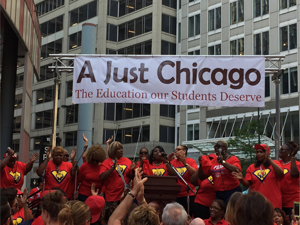 Early in May, the CTU filed an unfair labor practice complaint against the school board accusing them of bargaining in bad-faith and refusing to engage in mediation toward a new contract. 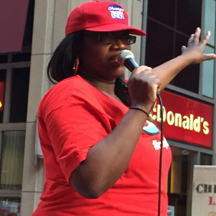 Today will be the first day since the rally and march, that CPS and the CTU will resume negotiations. Given the current major conflicts, this will be a long summer for all sides of these contract talks. Wow. It really boils down to the fact that teachers want money for their salaries and pensions. It has nothing to do with the children. Wake up. This is the real world. No one in the private sector gets all the bennies teachers get. It’s time to get real. Unions have no place in government.